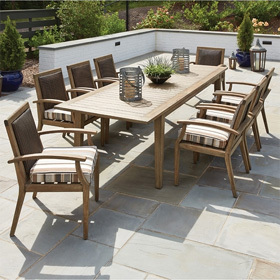 A patio dining table with fireside ambience and warmth. 54" round hammered copper table top great for seating 4-6 dining chairs. Unique dining height (29"H) OW Lee fire pit table. OW Lee also offer's occasional height (18.25"H), chat height (24"H), and counter height (38"H) fire pit tables. 54"L x 54"W x 29"H 270 lbs.